Our 3rd event in this series – Women & Men as Allies: Now What?/What Now? The Urgency of an “Allies Agenda” – was a conversation about how women and men can be allies as we face four uncertain, unstable, and unsettling years and how can as women and men, work together to hold on to the gains we’ve made and promote a gender equality agenda. 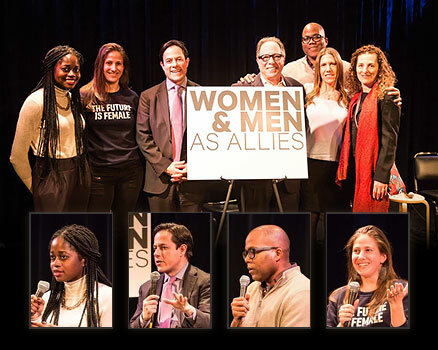 The event – in partnership with The Center for for the Study of Men & Masculinities – featured a panel discussion with Joelle Gamble, Dan Garodnick, Jimmie Briggs, and Alexis Grenell, moderated by Marianne Schnall and Michael Kimmel – and was supported by RTM Limited. Like our initial event and previous Women & Men as Allies conversation on "At Work and At Home", the room was filled with incredible people, including members of the Feminist.com board and advisory board, along with many longtime friends, supporters and colleagues. The Center for the Study of Men and Masculinities was founded in 2013 at Stony Brook University — the first such center on the world dedicated to exploring men’s lives and engaging men and boys for gender equality. Our mission is to foster a dialogue between researchers and activists working to engage men, and to inspire researchers to provide activists with work they need to be more effective. The Center runs seminars and develops activist-based research projects. RTM Limited is a US-based consulting and communication firm that does highly individualized work. We were founded on the conviction that an organization is best understood as a living, communicating organism in a rapidly-changing, vigorously-interactive environment. Join our mailing list to receive updates about our future events and comprehensive Women & Men as Allies microsite – and how you can support our work.